With Thanksgiving fast approaching, we thought we’d share some braces friendly recipes that will be delicious additions to your holiday menu. These dishes approach classic flavors from a slightly different angle, so they’re perfect if you’re wanting to change things up a bit this year. Sweet potatoes are already sweet (hence the name, right? ), so why not trade the marshmallows for the smoky spice of chipotle this year? This recipe is easy to make and can be customized to suit your family’s tastes. Preheat oven to 450 degrees F (230 degrees C). Lightly grease a 2 quart baking dish and set aside. Line a baking sheet with aluminum foil. Pierce each sweet potato several times with a fork, and place on the prepared baking sheet. 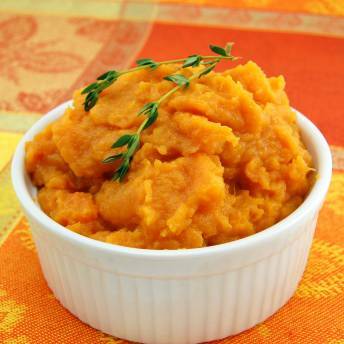 Roast the sweet potatoes in preheated oven until easily pierced with a fork, 1 to 1 1/2 hours. Remove from the oven, and cool about 15 minutes. Reduce oven temperature to 350 degrees F (175 degrees C). When sweet potatoes are cool enough to handle, cut in half and scoop flesh into a mixing bowl. Discard potato skins. Beat the sweet potatoes with the chipotle peppers, butter, and salt; spread evenly in the prepared baking dish. This can be baked now or refrigerated until the next day. Bake in the preheated oven until heated through, 20-25 minutes. Can be prepped ahead of time so all you have to do is pop it into the oven on the big day. Gradually adjust heat to taste. Remember, you can always add more but you can’t take away. Keep the smoke and omit the spice altogether by using paprika instead of chipotle. Add a little extra sweetness by drizzling maple syrup or sprinkling brown sugar on the potatoes before baking. The pumpkin lovers in your family will not be disappointed when you “roll out” this dessert after Thanksgiving dinner (pie who?). With over 40 reviews and a nearly perfect 5 star rating, this confection is sure to become a new holiday favorite. NOTE: Make sure the pecans are finely chopped or consider omitting them altogether to keep things braces friendly. Preheat the oven to 350 degrees F. Grease and flour a 17 1/2- by 12 1/2-inch jellyroll pan. With an electric mixer, beat the eggs, granulated sugar, pumpkin and lemon juice until smooth. Sift together the flour, ginger, salt, baking powder and cinnamon. Add the sifted ingredients to the egg mixture and blend until fully combined. 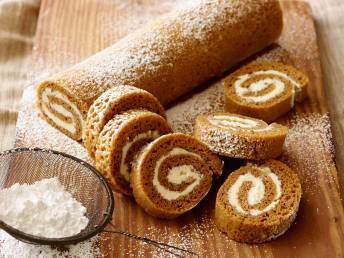 Spread the batter in the jellyroll pan. Sprinkle the dough with the chopped pecans. Bake until a cake tester inserted in the center comes out clean, 14 minutes. Let the cake cool in the pan for 5 minutes. Invert the cake onto a wire rack. Sprinkle some of the confectioners’ sugar on a large tea towel and carefully transfer the warm cake to the towel, folding the sides of the towel over the cake. Roll the cake up in the towel and cool in the refrigerator thoroughly for about 45 minutes. With an electric mixer, combine the confectioners’ sugar, cream cheese, butter and vanilla and beat until smooth. Carefully unroll the cooled cake and spread the mixture on top of the cake. Gently re-roll the cake and refrigerate it until you’re ready to slice and serve. Dust with confectioners’ sugar just before serving.